Monogrammed bath towels are a great gift idea and the perfect way to make bath linens unique and personal. There are many different ways to monogram towels. The most common style uses three initials: however, the order of the initials can vary. The letters can be used in order, from first name, middle name to last name. Another common style is for the last name to be placed in the middle of the monogram and the font made larger than the other two initials. Married couples typically use their first name initials placed on either side of their shared last name initial. Some prefer a simpler and elegant monogram by using just the last name initial by itself. There are also two letter monograms, that consist of the first and last name initials. People with more than three names will use more than three initials. For example, a man named John Travis Westly Smith might prefer the initials JTWS or JTSW. A married woman that wants to keep her maiden name might choose to use both initials of her hyphenated last name, such as Jami Nicole Jennings-Atherton to read as JNJA. There are no rules when it comes to monogramming. It is simply a matter of personal choice. There are dozens of different fonts and embroidery designs available for monogramming. Some favored monogram colors are tone on tone, meaning the thread used in creating the monogram is the same color as the towel you selected. You can also choose a different color to make the monogram standout. Your options depend on where you decide to purchase your monogrammed bath linens. It you know how to sew, you may wish to add the monogram yourself. 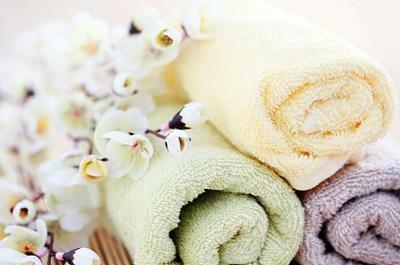 Sew4Home offers instructions on how to monogram your own bath towels. Monogramming does not end with just adding initials. You can further personalize bath towels by adding your business logo, creative designs or personal messages.The basic guidelines for monogramming towels is to place the monogram two inches above the hem on hand towels and four inches above the hem on bath towels. To make sure you sew the monogram on the correct towel side, use the label as a reference point. You want the monogram to appear on the opposite side of the towel from the label. If you are looking for simple, single initial monogrammed bath towels, you can find bath towels with letters on them from A-Z that can be ordered and shipped in just a few days. If you are personalizing your monogrammed towels with custom lettering or designs, then you need to allow more time for the towels to be customized and shipped. Keep in mind that most custom linen orders cannot be returned. Make sure you check with the company's return policy before placing an order. Some companies are also willing to send you fabric and thread swatches to show you examples of their embroidery work. This is a good idea, especially if you are a very particular about colors shades, as computer monitors can vary when it comes to color appearance.